As a pre- and postnatal personal trainer, I wish I could say I had a “fit” pregnancy. To be honest, it was more like nine months of letting go of expectations and severely modifying my life and workouts. I sought out help from experts. I invested big time in self-care. I refused to give up on being active. I understood that some things were not in my control, but I did what I could to stack the cards in my favor and I have no regrets. I’m not ready to call any of this a silver lining, but I will admit that I learned a LOT. Following are some of the resources and actions that helped me the most. Swimming Swimming was the only exercise I was able to continue doing without modification through my entire pregnancy. It was just as important for me mentally as it was physically—to be able to move my entire body without feeling pain or pressure and to get my heart rate up and challenge my cardiovascular system. Swimming kept me feeling strong up until the day I delivered and gave me confidence that my body was still capable of great physical feats. Physical therapy I developed sacroiliac (SI) joint pain early in the second trimester and began seeing a physical therapist (Toshi at Body Gears Oak Park) at around 20 weeks. We were able to gradually reduce my symptoms to the point where I was able to do basic daily activities without pain in my hips or low back. Now that baby is out, my SI joint feels completely normal. 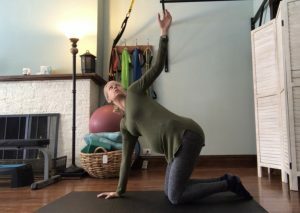 Strength training When I first learned I was pregnant, I vowed to listen to my body and not get too attached to my ability to do any exercises. I ended up modifying movements much sooner and more drastically than I’d expected. But the fact that I kept moving and that I respected the changes my body was going through was important to me. Yoga TuneUp Balls and Massage My hips were extremely achy during this pregnancy and I found it very helpful to use these massage balls on tight muscles and tissue. I used three different size/density balls for different areas and literally carried at least one ball with me at all times. At times, I really just needed to lie on a table and let someone make me feel better. I saw a massage therapist once every three or four weeks through my second and third trimesters. Lying down During the third trimester, I was dealing with a very low baby and lots of pelvic pressure (baby was pressing on my bladder). Sometimes my body just needed a reset. It was weird at first to just lie down in the middle of the day, but taking the time to rest—even if it wasn’t to nap—helped me get through long days. Spinning Babies About that low baby … she was also breech, in a footling position, for a good portion of my pregnancy. 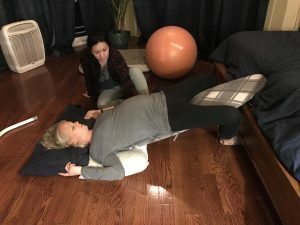 At 30 weeks I met with a Spinning Babies instructor and doula, who taught me some techniques to encourage baby to get in a head-down position. 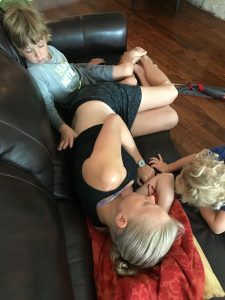 I did these moves religiously for the remainder of my pregnancy, as they felt really great for my body and reassured me that I was doing everything I could to create space for baby. While I don’t know exactly what led baby girl to flip, she gradually moved to a transverse position and then got head-down right at 36 weeks, a week before I delivered. Squatty Potty I’ve used a Squatty Potty or stool for the past few years, but it became particularly useful during the last month of this pregnancy, as I felt more constipated than usual. Elevating my feet helped me avoid bearing down, reducing any added strain to my pelvic floor. Chiropractic Around the time I started seeing a physical therapist, I also saw a chiropractor (Watson Chiropractic in Oak Park) who specializes in women’s health and Webster Technique for several adjustments to help with my SI joint pain. I resumed seeing her at around 30 weeks, to help create space for baby to get in a head-down position. Support belts During the time my SI joint was bothering me, I wore a Serola belt to help manage my symptoms. Later when baby was bigger and low in my pelvis, I switched to a pregnancy support belt to lift baby up and reduce pressure. Letting go of expectations This was a big one for me. Not only am I normally very active, but also I have a very energetic, physical parenting style. There are things that my boys and I do every year that we skipped this year because they were too physically demanding. 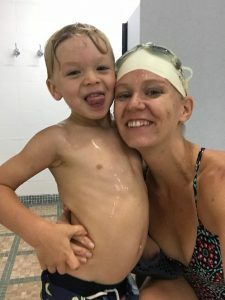 At first I was struck by mom guilt and FOMO for my boys. But once I learned to adjust my expectations, I was able to find new positives in our temporarily modified lifestyle. The biggest of these was that my boys learned about empathy, and that mama isn’t invincible. They became more concerned about my well being and were understanding when I told them we couldn’t do something because it was too much for me. Now postpartum and healing, I am appreciating their continued support.